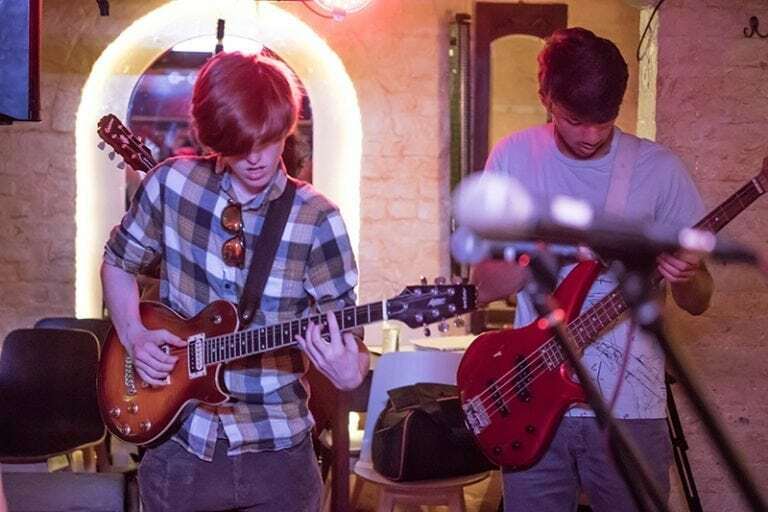 After weeks of hard work, members of Folkestone Music Lab performed at their very first gig for family and friends on Saturday 30th June at The Chambers in Folkestone; a popular live music venue. The Folkestone Music Lab, a group run by Kent Music in partnership with The Creative Foundation and the Folkestone Academy is a creative space for young people aged 11-19 to work on band development, music technology and production, singing and instrumental skills, song writing and more, guided by experienced tutors. The Lab is committed to Youth Voice and we want our members to have a big say in how it develops and what it does each week. When the Lab started in February 2017, many of the performers were scared of the idea of performing live, so their decision to organise a gig shows how far they have come. One 17 year old member from Folkestone Academy, while introducing the first song, made a particular point of saying how much it meant to her and to her fellow musicians to be making a public stage debut. The set included Kingdom in the Sky and Midnight Sunshine, songs written and arranged by the Lab’s members and performed with tight discipline and attitude. The audience were both moved and impressed by the performances, telling Kent Music’s staff that they ‘were very proud’ and ‘thank you for this, it was so good’. Our members are now busily writing new songs for their next gig and looking forward to adding to Folkestone’s reputation as a creative place. The Folkestone Music Lab runs every Saturday during school term time and can be accessed by anyone in secondary education for a small fee of £2 a session. Equipment is provided and no experience is required, all instruments catered for. All new members need is a wish to make music. It is a great opportunity to meet new like-minded people and join a band.